Practice tests, solutions, and tips to help you pass employers' diagrammatic tests. Diagrammatic reasoning tests (often used interchangeably with abstract reasoning tests) are commonly used aptitude tests used by recruiters to assess a candidate’s ability to think logically and solve complex problems. Candidates applying for roles which require high level of problem solving ability and logical reasoning, such as management consulting, engineering and finance are likely to encounter a diagrammatic reasoning test. Compared to other ability tests and other psychometric assessments, diagrammatic reasoning is a very specific skill, requiring only a few similar abilities. For this test candidates will not be required to used any prior knowledge, and the questions on the test will not vary depending on the role or industry recruited for. Try one of our free tests to see how they help you improve. Try a real Inductive reasoning test. Give it a go to see how a real test works! 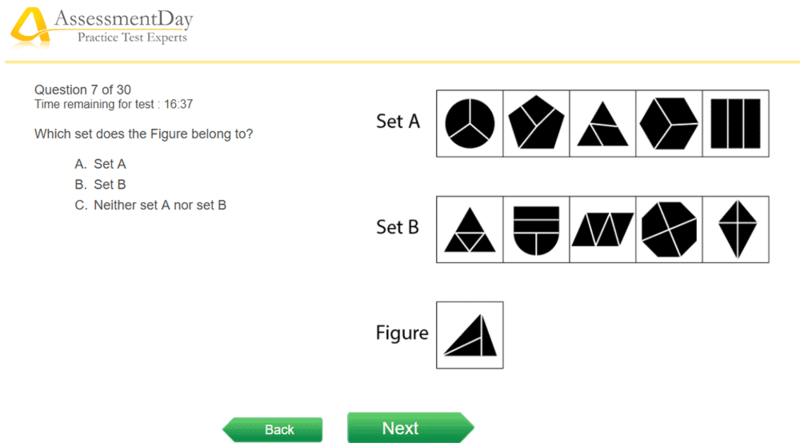 This free diagrammatic reasoning test contains 30 questions and has a time limit of 25 minutes. This free diagrammatic reasoning test contains 20 questions and has a time limit of 18 minutes. It is important for candidates to remember that the function of a diagrammatic reasoning test will vary depending on the stage of recruitment it is being used in. If the diagrammatic reasoning test is being given during the early stages of recruitment, for example directly after application, then this test will be used as a screening tool. As a result poor performance on this test may result in an early screening out of the selection process. However if the test is being given during the later stages of a recruitment process then this test will be used in conjunction with numerous other tests and exercises, and therefore will not be the sole decider of the selection decision. Although no prior knowledge is needed, and no materials will be provided for study by the employing organisations, candidates are strongly advised to prepare and research these tests as fully as possible to ensure maximum performance on this test. These tests will be under timed conditions and candidates will be advised to work both quickly and accurately. These time limits will however be generous enough to allow you to think abstractly and logically, so it is essential to not feel rushed. The timing structure may vary depending on the type of test, some tests may time each question, and some may simply time the entire test. Diagrammatic reasoning may appear very dissimilar to other types of test and other skills which candidates use in everyday life, and combine this with a time limit and you have a particularly stressful anxiety provoking test. Adequate practice beforehand, enough rest/sleep the night before and plenty of calm deep breathing can go a long way, and help avoid the nervousness associated with psychometric tests. Candidates are advised to try and figure out the correct answer based on the flowchart before looking at the multiple choice answers. If this is not adhered to then candidates may simply pick the answer which looks like it could be right, rather than figuring out the correct answer and then selecting it. Many of the diagrams in the multiple choice section may look very similar, and without a clear image in your head of what you are looking for, you may fall victim to selecting the wrong one. Diagrammatic tests, abstract reasoning tests and numerous other logical reasoning tests are often used interchangeably, therefore candidates are advised to ask the employing organisation what type of test they will be undertaking. True diagrammatic reasoning tests will involve input-output symbols and diagrams; however an abstract reasoning test may involve other mechanisms of testing ability. The only test publishers which use the term diagrammatic reasoning are Saville Consulting and Cubiks. So if you are told you are going to take a diagrammatic test (as opposed to an inductive, abstract, or a logical test) the chances are that the test will have been designed by one of these publishers. Saville Consulting's diagrammatic tests assess candidates' ability to evaluate processes through diagrams. The stand-alone diagrammatic test is 24 minutes and has 32 questions. If you take this as part of a combined test (such as their Swift series) the diagrammatic element will be shorter: 6 minutes. The Cubiks diagrammatic test (sometimes referred to as their Reasoning for Business test) asks candidates to analyse two groups of similar symbols, and decide whether a symbol belongs to either group A, group B, or neither group, based on the grouping rules. Practice diagrammatic reasoning tests as offered by AssessmentDay provide an ideal way of practicing and preparing yourself for a big diagrammatic reasoning test. Practice diagrammatic tests allow candidates to learn from their mistakes and therefore continually improve. Similarly familiarising yourself with the layout, the questions and being under timed conditions will help dispel the mystery associated with taking a new test. Knowing what you’re up against can be a significant advantage when taking a diagrammatic reasoning test, and help build the confidence needed to succeed. It is important to practice for your diagrammatic reasoning test, particularly if this is the first time you have taken one. Diagrammatic reasoning is an ability not often used in everyday life, but it does correlate with particular work place relevant abilities, so employers will continue to use them and you ought to get used to them. Buy our full practice pack for the best preparation.